When using the Authorization header to authenticate requests, the header value includes, among other things, a signature. The signature calculations vary depending on the choice you make for transferring the payload (Overview). This section explains signature calculations when you choose to transfer the payload in a single chunk. The example section (see Examples: Signature Calculations) shows signature calculations and resulting Authorization headers that you can use as a test suite to verify your code. 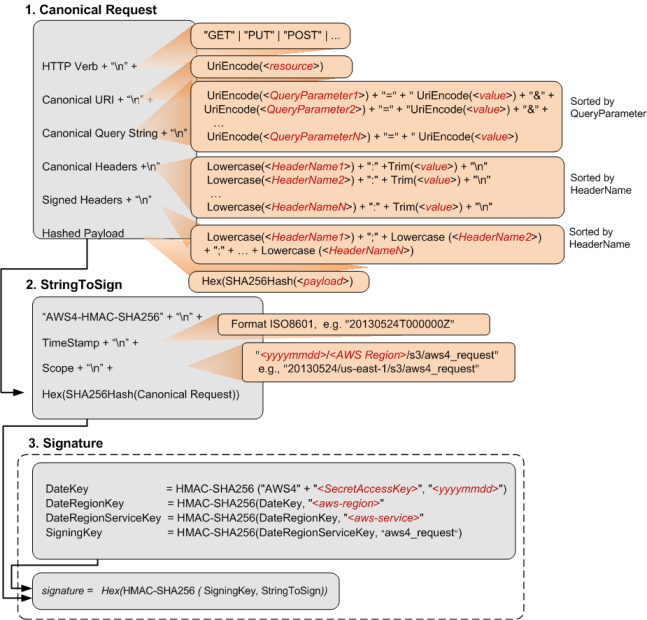 Signed payload option – You include the payload hash when constructing the canonical request (that then becomes part of StringToSign, as explained in the signature calculation section). You also specify the same value as the x-amz-content-sha256 header value when sending the request to S3. Unsigned payload option – You include the literal string UNSIGNED-PAYLOAD when constructing a canonical request, and set the same value as the x-amz-content-sha256 header value when sending the request to S3. When you send your request to S3, the x-amz-content-sha256 header value informs S3 whether the payload is signed or not. Amazon S3 can then create signature accordingly for verification. When Amazon S3 receives an authenticated request, it computes the signature and then compares it with the signature that you provided in the request. For that reason, you must compute the signature by using the same method that is used by Amazon S3. The process of putting a request in an agreed-upon form for signing is called canonicalization. This section provides an overview of creating a canonical request. You do not normalize URI paths for requests to Amazon S3. For example, you may have a bucket with an object named "my-object//example//photo.user". Normalizing the path changes the object name in the request to "my-object/example/photo.user". This is an incorrect path for that object. UriEncode("acl") + "=" + ""
If the URI does not include a '? ', there is no query string in the request, and you set the canonical query string to an empty string (""). You will still need to include the "\n". The Lowercase() and Trim() functions used in this example are described in the preceding section. If the Content-Type header is present in the request, you must add it to the CanonicalHeaders list. Any x-amz-* headers that you plan to include in your request must also be added. For example, if you are using temporary security credentials, you need to include x-amz-security-token in your request. You must add this header in the list of CanonicalHeaders. The x-amz-content-sha256 header is required for all AWS Signature Version 4 requests. It provides a hash of the request payload. If there is no payload, you must provide the hash of an empty string. The following is an example CanonicalHeaders string. The header names are in lowercase and sorted. For the purpose of calculating an authorization signature, only the host and any x-amz-* headers are required; however, in order to prevent data tampering, you should consider including all the headers in the signature calculation. HashedPayload is the hexadecimal value of the SHA256 hash of the request payload. For example, when you upload an object by using a PUT request, you provide object data in the body. When you retrieve an object by using a GET request, you compute the empty string hash. This section provides an overview of creating a string to sign. For step-by-step instructions, see Task 2: Create a String to Sign in the AWS General Reference. The constant string AWS4-HMAC-SHA256 specifies the hash algorithm that you are using, HMAC-SHA256. The timeStamp is the current UTC time in ISO 8601 format (for example, 20130524T000000Z). Scope binds the resulting signature to a specific date, an AWS region, and a service. Thus, your resulting signature will work only in the specific region and for a specific service. The signature is valid for seven days after the specified date. date.Format(<YYYYMMDD>) + "/" + <region> + "/" + <service> + "/aws4_request"
For Amazon S3, the service string is s3. For a list of region strings, see Regions and Endpoints in the AWS General Reference. The region column in this table provides the list of valid region strings. The following scope restricts the resulting signature to the us-east-1 region and Amazon S3. Scope must use the same date that you use to compute the signing key, as discussed in the following section. In AWS Signature Version 4, instead of using your AWS access keys to sign a request, you first create a signing key that is scoped to a specific region and service. For more information about signing keys, see Introduction to Signing Requests. This signing key is valid for seven days from the date specified in the DateKey hash. For a list of region strings, see Regions and Endpoints in the AWS General Reference. Using a signing key enables you to keep your AWS credentials in one safe place. For example, if you have multiple servers that communicate with Amazon S3, you share the signing key with those servers; you don’t have to keep a copy of your secret access key on each server. Signing key is valid for up to seven days. So each time you calculate signing key you will need to share the signing key with your servers. For more information, see Authenticating Requests (AWS Signature Version 4). The final signature is the HMAC-SHA256 hash of the string to sign, using the signing key as the key. For step-by-step instructions on creating a signature, see Task 3: Create a Signature in the AWS General Reference. Request timestamp of 20130524T000000Z (Fri, 24 May 2013 00:00:00 GMT). The bucket is assumed to be in the US East (N. Virginia) region. The credential Scope and the Signing Key calculations use us-east-1 as the region specifier. For information about other regions, see Regions and Endpoints in the AWS General Reference. The following example gets the first 10 bytes of an object (test.txt) from examplebucket. For more information about the API action, see GET Object. Because this GET request does not provide any body content, the x-amz-content-sha256 value is the hash of the empty request body. The following steps show signature calculations and construction of the Authorization header. In the canonical request string, the last line is the hash of the empty request body. The third line is empty because there are no query parameters in the request. You are requesting REDUCED_REDUNDANCY as the storage class by adding the x-amz-storage-class request header. For information about storage classes, see Storage Classes in the Amazon Simple Storage Service Developer Guide. The content of the uploaded file is a string, "Welcome to Amazon S3." The value of x-amz-content-sha256 in the request is based on this string. For information about the API action, see PUT Object. In the canonical request, the third line is empty because there are no query parameters in the request. The last line is the hash of the body, which should be same as the x-amz-content-sha256 header value. The following GET request retrieves the lifecycle configuration of examplebucket. For information about the API action, see GET Bucket lifecycle. Because the request does not provide any body content, the x-amz-content-sha256 header value is the hash of the empty request body. The following steps show signature calculations. In the canonical request, the last line is the hash of the empty request body. The following example retrieves a list of objects from examplebucket bucket. For information about the API action, see GET Bucket (List Objects) Version 1. Because the request does not provide a body, the value of x-amz-content-sha256 is the hash of the empty request body. The following steps show signature calculations. In the canonical string, the last line is the hash of the empty request body.